Our favorite Doo-Wopping Cats, who cut their a cappella teeth with Disney (like Sweeps winners Toxic Audio) and won the So. Cal. Harmony Sweeps, celebrate their 18th year together by finally saying yes to the many fans who have asked for a Christmas album. The upbeat, nostalgic original "A Christmas Long Ago," a wonderfully Doo-Woppy "Let It Snow," a bluesy "Please Come Home for Christmas" to slow dance to, a finger-snapping, Bing-imitating "White Christmas," some yummy falsetto on the Beach Boys' "Little St. Nick," a silly, manic "Rudolph The Red Nosed Reindeer," a very funny "Blue Christmas" (Yes, Royce "Elvis" Reynolds is back! ), a rhythmic, joyous "Feliz Navidad," a sweet baritone lead on "Sleigh Ride" and closing with the bluesy-jazz harmonies of "What Are You Doing New Year's Eve;" it's all good. Yummy deep-bass harmonies, lots of the Cats' trademark humor, great arrangements by the group and in collaboration with original Cat Todd Dixon--"Long Ago," the group's 5th winner, is a stone joy, and you should also check them out live in concert in their hot DVD! The enthusiasm of the Alley Cats is so infectious and their energy so buoyant that they can make you like any song they sing. It's true! Having gotten their start at Disneyland's 'Magic Kingdom,' they exhibit a merry disposition that bursts through even on CD-they cannot be contained! A host of classic tunes such as 'Book Of Love,' 'Don't Be Cruel' and 'Duke Of Earl,' which could be perfunctory in lesser hands, are pounced on by the Alley Cats, and are the better for it. The arrangements are familiar but with a little added pizazz (we'd encourage more! ), the intonation crisp, the rhythms fluid. A highly professional and entertaining recording. 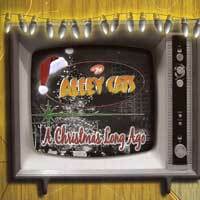 The Alley Cats, from Southern California, are your destination for fun! This four piece doo wop group also incoporates classics such as 'Barbara Ann' and 'La Bamba' into their terrific repertoire, which includes can't-miss hits like 'Under the Boardwalk' and 'Why Do Fools Fall in Love.' They mimic psychedelic guitar twanging on 'Love Potion #9' and sizzle with finger- snappin' energy on the arpeggiated chords of 'Rock and Roll is Here to Stay.' 'Runaround Sue' crackles with energy and humor-these guys are clearly veteran performers. A highly professional and entertaining recording. These Alley Cats will win you over! One of our favorite all-male Doo-Wop quartets of all time, The Alley Cats first got together for some streetcorner harmonizing at Fullerton College (CA) in 1987, were the Disney house Doo-Wop band and won the LA Harmony Sweeps Regional. So we had our chance to be blown away by their dynamic and hilarious live act at both the West Coast A Cappella Summit as well as at the Harmony Sweeps National Finals. "Greatest Hits" is of course a "Best Of," featuring winners like "Don't Be Cruel" and "Sh-Boom" from their best-selling CD "The Doo-Wop Drive-In Live;" "Remember Then" from the CD "Strike #! ;" "Morse Code of Love" and "Love Potion #9" from "Cruisin';" "Little Darlin'," "Come Go With Me" and "The Lion Sleeps Tonight" (the best we've ever heard it) from "The Cat's Meow;" plus two never released cuts, "The Longest Time" and "Unchained Melody." Also included are 5 stellar cuts from their new live show, "Bandstand Boogie," "Rock Around The Clock," "Sherry," "Higher and Higher" and Tennessee Ernie Ford's deathless top-40 hit "Sixteen Tons." And finally, the Cats' very first, very hot original Doo-Wop song, "You Make Me Weak!" "Greatest Hits" is a Doo-Wop party, Big Fun from first cut to the 17th-don't miss this one! While entertaining thousands as Disneyland's house band, (and performing a killer "Showcase Concert" at the West Coast Summit), the four-man Alley Cats, "America's Premier Doo-Wop Group," released three great studio recordings and gained many fans in concert. "Drive-In" puts us in the audience of an electric, hilarious live performance, at the Oxnard Performing Arts Center in 2003. 19 songs, like "Sh Boom," The Temptations' "My Girl," Del Shannon's "Runaround Sue," "La Bamba," "Sixteen Candles," "Don't Be Cruel," "Poison Ivy," "Stand By Me" and more. 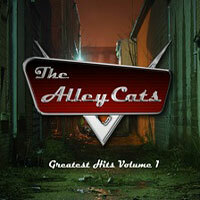 But the big fun of the Alley Cats' stage act is more than just top-drawer Doo-Wop--these guys are stone entertainers whose patter and interactions with the audience (and a great Neil Diamond impersonation) are a scream. "America's Premier Doo-Wop Group?" We'll buy that! When we first saw the Alley Cats it was giving a "showcase concert" on a small school stage at the A Cappella Summit, singing 4 or 5 songs. What was clear was that these four young guys simply performed sweeter, better-arranged, funnier, more together Doo-Wop than anyone we had ever heard. "9 Lives" (9 "live" performances, get it?) proves that they are even more so now. Their song selection includes our very favorites: "Blue Moon," "Duke of Earl," "Come Go With Me," "Little Darlin'," "La Bamba," "Little Bitty Pretty One," "The Book of Love," "Barbara Ann," plus 3 bonus tracks, including "The Lion Sleeps Tonight," "Smoke Gets In Your Eyes" and "Rock N Roll is Here to Stay." The DVD includes cool footage from their appearances on Arsenio Hall and other shows, and begins with live songs from an outdoor California festival, then follows the guys on their ride to Vegas for very hot performances and outtakes there. 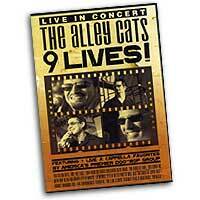 Alley Cat fans, you of course will buy this DVD because you know that the Cats are "America's Premier Doo-Wop Group." Those unfamiliar with the group, you of course will want to see how good you have to be to bill yourself as "America's Premier Doo-Wop Group," and you won't be disappointed. We love these guys, and "9 Lives" is a treat from beginning to end!